June. Stonehenge Free. Bikers trash punks at Stonehenge Free; punks have turned up to see Crass, whose Penny Rimbaud had been involved in setting up Stonehenge Festival in the first place. Barbed wire round the stones, hippies complain when they are strip-searched in public. The line-up is surprisingly impressive (so an obscure website database tells me): reggae and ska bands Misty in Roots, Selector, pop band the Thompson Twins, new wavers Flux of Pink Indians, as well as old stalwarts like Hawkwind and Nik Turner’s Inner City Unit. June 21. Knebworth. Unimpressed with the antics of Led Zeppelin’s manager last year, the organisers only agree to run another festival with a change of musical direction. Capital Radio sponsors a middle of the road festival: Beach Boys (Brian Wilson slumped over the piano), Mike Oldfield, Santana, Elkie Brooks. 5,000 ping pong balls are dropped on the crowd from a B17 Flying Fortress bomber plane (I don’t know why); the wind blew them into another field. No Glastonbury festival, following last year’s financial loss. Instead, in July: Worthy Farm is host to the first Ecology Party Summer Gathering, a mix of greens (without the official backing of the Ecology Party, which would become the Green Party) and festival-goers. In a nearby barn amplified music is supplied by Roy Harper, Nik Turner’s Inner City Unit. Around 500 people. Albion Fairs through East Anglia: a movable feast in the countryside, from one weekend to the next. New Age Gypsy Fair, Inglestone Common, Avon. One of 47 alternative fairs and festivals that summer identified by FWS. Through the early years of the decade festival culture as an alternative to the yuppie culture of Thatcherism spreads, from the Albion Fairs in East Anglia, to free festivals in Wales and Norwich, to the peace-oriented Moon Fairs at Nenthead in Cumbria. August: First Actual Festival, featuring free jazz, founded by Anthony Wood and went on until 1984. Originally six days in August at the Institute of Contemporary Arts Theatre (1980–83); later six days in October at the Bloomsbury Theatre (1984) to audiences of 1000. The festival was preceded by four concerts under the same name in Notre Dame Hall (February–April 1980). 16 August. Castle Donington, Derbyshire. Monsters of Rock festival, featuring Ritchie Blackmore’s Rainbow. World of Music, Arts and Dance (WOMAD) formed. The organisation founded by Peter Gabriel will be central in presenting world music to festival audiences in Britain and overseas. February. 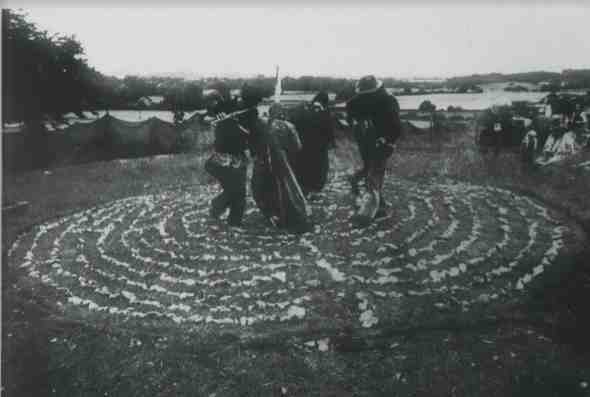 Greenham Common Peace Camp declares itself a female zone. In March, at a CND rally there, Inner City Unit play free. June 19-21. A change of name, from ‘Fayre’ to ‘Festival’. Glastonbury CND Festival, the first time CND is involved. The formation of Mid-Somerset CND early in 1981 sparked greater interest locally. Old hippie stalwarts like Ginger Baker, Gong, Hawkwind—as well as newer acts like Aswad, New Order, John Cooper Clarke. Speakers included E.P. Thompson. Worthy Farm puts up the money, books the acts, organises the actual event, while National CND handles publicity and sells tickets. The Pyramid Stage returns, this time as a permanent structure, with planning permission as a cow shed when not in use by the festival (ironically its metal sheeting was army surplus). Attendance: 18,000 people, paying £8 for weekend tickets, and £20,000 raised for CND. June. Stonehenge Free. Over one hundred arrests, some fighting with police. Again, lineup quite impressive, and reflecting more recent changes in pop music taste, with reggae and punk featuring prominently: Black Slate, the Damned, the Ruts. July. Worthy Farm. Six-day Ecology Party Summer Gathering. Acoustic music only this time, as a matter of policy. Around 1500 people. Though it is mainly advertised through the Ecology Party, at the end of the gathering activists decide that future events will be Green Gatherings, to attract people from all parts of the movement. Green CND is formed here. July. Chapeltown, Leeds. RAR Carnival. Misty in Roots, the Specials, the Au Pairs. July 8-12. Inglestone Common, Avon Free Festival. July 25-26. Knebworth. Another change of musical direction. George Wein, of Newport Jazz Festival, books the bands for the Capital Radio Jazz Festival at Knebworth. September 4-14. Psilocybin Fayre, Devil’s Bridge, Wales. Landscape, (legal) drugs and free festival culture come together at a magic mushroom harvest event. September 6. Winchester Fayre, another revived event from an ancient charter. September to November. USA. The original Earth First! Road Show tours coast-to-coast across America, raising the profile of the new direct action local radical environmentalist organisation. EF!’s use of the term ‘Road Show’ later ironically dropped in light of massive anti-roads protest by British Earth First! in 1990s. 24 October. London. Biggest national CND demonstration to date. June 6. Hyde Park, London. Estimated 250,000 people demonstrating at a CND march and carnival. June 18-20. Glastonbury Festival. Note that the date of the festival is moving from the solstice itself to the weekend nearest to the solstice. CND more involved in the organisation of the festival, West Region CND doing the gates and Mid-Somerset CND responsible for the information stalls. Van Morrison sings ‘Summertime in England’, reggae bands Aswad and Steel Pulse, U2 near the bottom of the bill, Alexei Sayle in the Theatre Area, and films by (as CND’s national publicity put it) directors like ‘Dereck Jarmone’. Pouring rain and muddy fields. From the USA (signalling the international profile the festival as part of the peace campaign is beginning to receive) comes Richie Havens, and Jackson Browne. In the dark a laser show traces the horizon during Tubeway Army’s ‘Are friends electric?’. Attendance 25,000 people. Tickets £8. June. Stonehenge Free. Around 20,000 come, 125 arrests (mainly for drugs and shoplifting from local stores). New Travellers leave en masse and head for Greenham Common to hold a ‘Cosmic Counter-Cruise Carnival’. TIn the wake of the Tipi People and the so-called Tibetans of the late 1970s, the nomadic festival-centred lifestyle is now represented by this group, the Peace Convoy. July 27-August 1. The first Green Gathering, a development of the Ecology Party Summer Gatherings, still at Worthy Farm. 5,000 people attend, including feminist peace group Women For Life On Earth with a dedicated women-only marquee. ‘For the first time we began to feel like a movement.… We all feel the Gatherings have generated a very specal energy, an Avalon energy which we are now taking to all parts of the world. 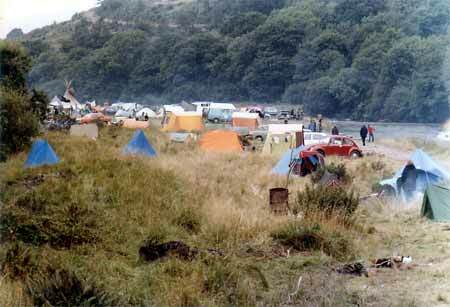 It was the 1982 Gathering though that had the most magical quality. It was the first Green Gathering’, writes one organiser. August 21. Castle Donington, Monsters of Rock Festival. Maybe that should have been Dinosaurs of Rock: Saxon, Uriah Heep, Status Quo, Gillan…. Shepton Mallett, Somerset. The first WOMAD festival. August 27-30. Knebworth. Another change in approach. Knebworth hosts the Green Belt festival, a Christian gathering that had grown larger over the previous eight years and now needed a more ambitious space. October. Milton Keynes Bowl. Peter Gabriel reunites with Genesis, explaining: ‘the motivation is to pay off the WOMAD debts’. May. Brockwell Park, London. CND carnival. Paul Weller’s new Style Council contribute some of the entertainment for the large crowd. June 17-19. Glastonbury Festival. 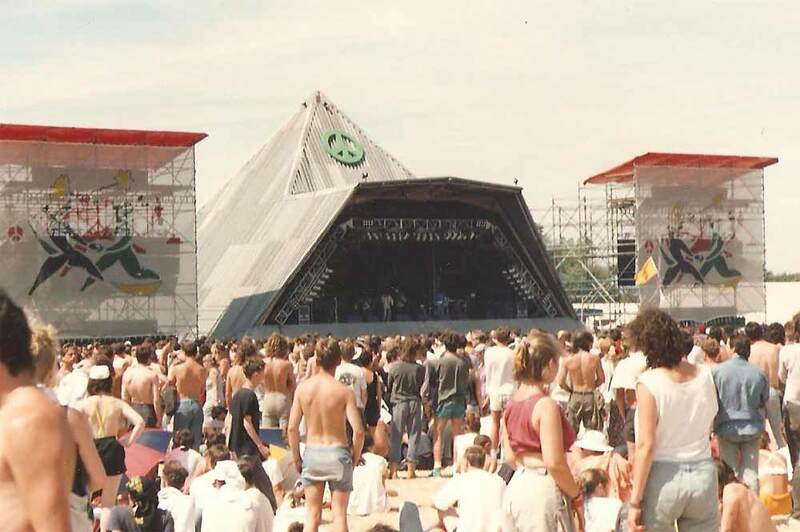 A public entertainment licence needed for the festival, as a result of the recently passed Local Government (Miscellaneous Provisions) Act, 1982. The licence costs £300 from Mendip District Council, and specifies a limit of 30,000 people (so, unsurprisingly, the official website states 30,000 as number of people attending), along with 23 other conditions. First appearance of the festival’s own radio station, Radio Avalon. World music beginning to appear: King Sunny Ade, the Chieftains, Incantation. £3,000 raised for local charities. 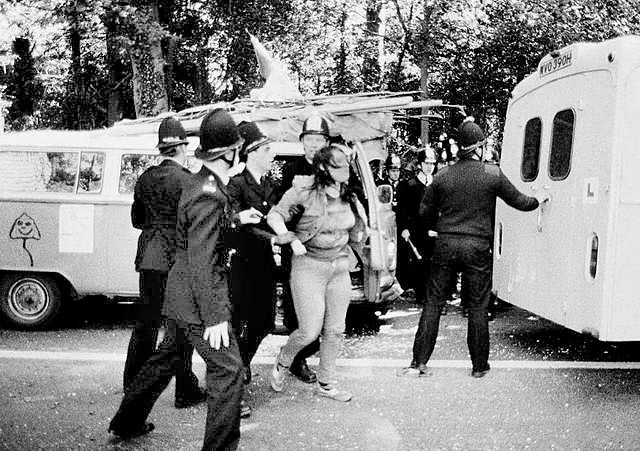 From 1981 to 1983 £133,000 raised for CND. Tickets £12, programmes 80 pence. June 16-22. Stonehenge Free. 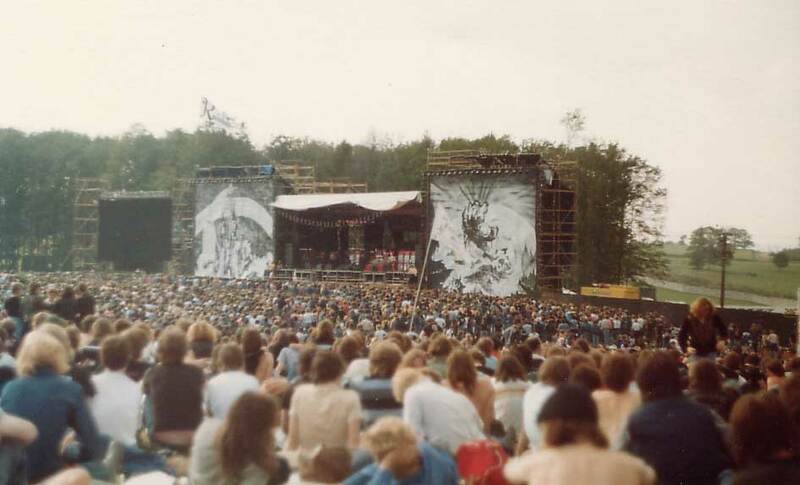 Followng a free festival appearance for bikers at a Motorcycle Action Group event in Somerset in early June, Hawkwind play a two-hour sunrise performance on solstice morning with the stones as backdrop, recalling their Atomhenge stage set of 1976. Over the course of the festival, three people die, a four year old girl from burns, a woman hitch-hiker in an accident, and one drugs overdose. July 27-29. Glastonbury Green Gathering moves from Worthy Farm to Lambert’s Hill Farm, near Shepton Mallet. The Peace Convoy makes an appearance, a contribution, and a large-scale police operation (felt by greens to be considerably over-the-top, though the Convoy is used to it) involves searches and taking details from New Travellers and greens alike. A naked potest march ensues. This is the Children’s Gathering, with entertainments and worshops based around their needs and desires. Also features the largest tipi circle seen to date outside north America. July-August. Regular commercial summer festival circuit offers variety of music and culture: Elephant Fayre at St Germain, Monsters of Rock at Castle Donington, Reading Festival, and the big free urban event, the Notting Hill Carnival in London. June 22-24. Glastonbury Festival. Eavis successfully defends himself in magistrates court against five charges brought by Mendip District Council of contravening conditions of last year’s festival, and permission is granted again, for 35,000 people. (Council officials however note large numbers of festival-goers without wristbands.) Dedicated fields for parking cars are stewarded by the PTA of West Pennard School. The blatant sale of drugs is an issue, with many signs posted saying SALE AND DISPLAY OF DRUGS FORBIDDEN (note this doesn’t even try to proscribe consumption), and the organisers even having their own undercover anti-drugs operation. Speakers include Bruce Kent of CND and Paddy Ashdown. Joan Baez, Ian Dury, Fairport Convention, Weather Report, and Nigerian superstar and rebel Fela Kuti. CND hot air balloon sails over the festival site. In part because of the trouble at last year’s Glastonbury Green Gathering, the first Green Field is introduced at the festival, introduces eco-issues, signals a growing awareness and shift of perspective towards the environment. £60,000 raised for CND. Tickets £13, programmes 80 pence. June. 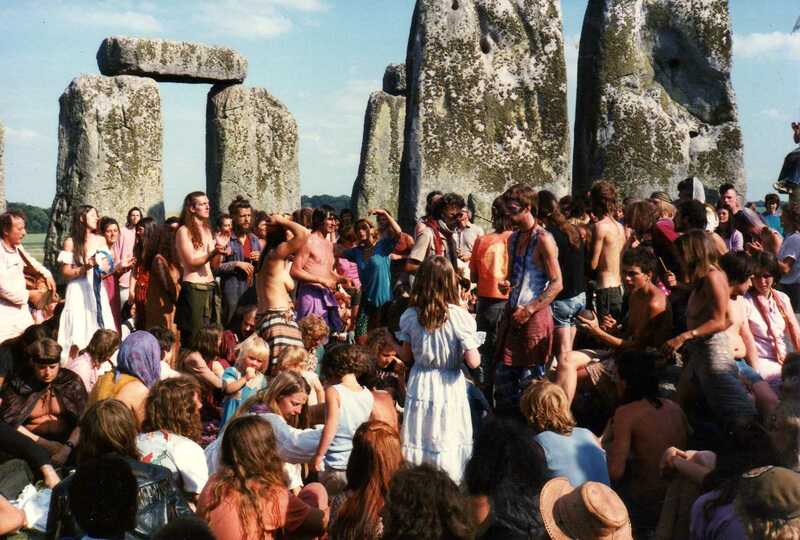 What turns out to be the final Stonehenge Free Festival (yet). 25,000 people turn up over the month of June. One man dies. Hawkwind perform Earth Ritual over two days, and The Enid do a set that feels two days long. Punks and hippies, difficult to tell them apart by now. August. Green Gathering at RAF Molesworth, Cambridgeshire. Perhaps radicalised by police treatment at last year’s Glastonbury Green Gathering, the Green Collective decides to organise an altogether more provocative squatted event, which leads to the formation of Rainbow Fields Village peace camp. June. Battle of the Beanfield, as New Travellers on their way to hold Stonehenge Free Festival are set upon by police a few miles from the stones. It is, as one Traveller admits, the beginning of the end for the Convoy. Some find their way to the welcoming orchard of Greenland’s Farm, Glastonbury. June 21-23. Glastonbury Festival, on an enlarged site due to the purchase of extra 100 acres from neighbouring Cockmill Farm. The programme includes an interview with anarcho-punks the Poison Girls. Roger Chapman returns to the pyramid stage he’d last played in 1971. Rain and mega-mud as in 1982. The Boomtown Rats play, with singer Bob Geldof performing just a few weeks before Live Aid. Echo and the Bunnymen headline. Tractors work overtime at the end to tow vehicles off site. 40,000 people. Tickets £16, programme 90 pence. £100,000 raised for CND and local charities. July 10. New Zealand. French Secret Service blow up the Greenpeace ship Rainbow Warrior, protesting about French nuclear testing in the South Pacific. One Greenpeace acivist killed. Essex. Peter Gabriel holds the first WOMAD Festival, Thomas Mapfumo, Toots and the Maytals, samba, country, etc. Reading Festival cancelled at the last moment. August. Bramdean Common. First Torpedo Town free festival on the South coast, featuring Hawkwind. August 24. London, Crystal Palace. Anti-Heroin Festival, with The Enid, Comsat Angels, Hawkwind. Alternative culture taking a stand on hard drugs. 26 April. Chernobyl, Ukraine. Nuclear plant explodes, twice in the space of a few seconds, and catches fire. Fallout drifts across much of the continent of Europe, and today in Britain some upland areas of north Wales, Cumbria are still contaminated by radiation and subject to government restrictions on livestock. The apocalyptic combination prophecied by some campaigners of nuclear and green issues together thus comes to pass. 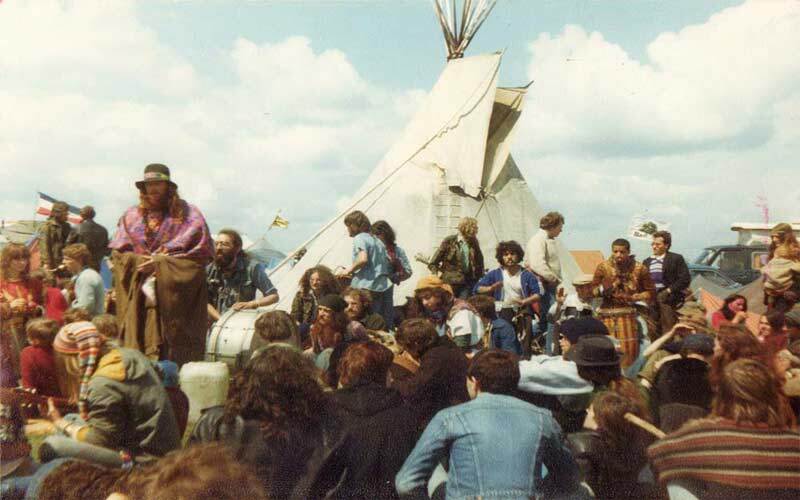 Some of the Peace Convoy of New Travellers, who would normally have gone to Stonehenge Free, turn up at Pilton in early June, following their mass eviction in a dawn swoop from Stoney Cross in the New Forest. They move off so as not to make life difficult for CND and Glastonbury—or, Eavis evicts them so as not to invalidate his insurance (take your pick). Later, Eavis involves himself in trying to find an alternative site for the Stonehenge event. June 20-22. Glastonbury Festival. Another major expansion—60,000 people attending now. The rate of growth through the 1980s begins to worry some of those involved in organising the event, though communications, welfare and medical provisions are extended, and the developing market areas relocated too. The Classical Tent introduced. Bands include the Pogues, Waterboys and Level 42. Tickets £17, programme £1. £130,000 raised for CND and local charities. July. Manchester. A festival to celebrate ten years of punk, with The Smiths, New Order, The Fall and newcomers Happy Mondays. Note the limited range of free and alternative festivals over the past couple of years: a result of the Thatcher government’s crackdown on New Travellers, unlicensed gatherings. Cantlin Stone Free Festival, Avon Free, Elephant Fayre and Meigan Fayre are among few that manage to survive round now. The East Anglian Fairs also run out of energy, have too many hassles trying to accommodate local needs with national problems. 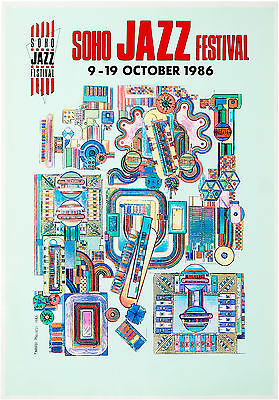 Soho Jazz Festival 1986 poster. Source: eBay. 9-19 October: First Soho Jazz Festival, founded and directed by Peter Boizot. Locations over time included Ronnie Scott’s, Pizza Express, 100 Club, The Astoria, and more than 60 restaurants and pubs in Soho; outdoor venues include Soho Square and St. Anne’s churchyard, with audiences of up to 1000 per concert. See 10 Days That Shook Soho (1986), a music documentary revealing the story of the inaugural 1986 Soho Jazz Festival. June 6-14. Smarden. Green Gathering. In a local referendum, Pilton villagers vote against the Glastonbury Festival continuing. Mendip Council ignores the result. June 19-21. Glastonbury Festival takes place, confirmed following annual licence wrangles with the local council as late as May. Described by NME as ‘an annual blend of mysticism, music and mild mayhem’. In something of a stylistic throwback, ‘the brightest spark’ at this year’s festival, according to NME, is Michelle Shocked, voice and acoustic guitar, managing to make a campfire atmosphere in spite of the rain. Also Van Morrison, Elvis Costello, New Order, Julian Cope, Billy Bragg, and the WOMAD stage for the first time. 60,000 people, tickets £21. £130,000 raised for CND and local charities. August 16-17. Harmonic Convergence. Centres of spiritual energy round the world are the focus of believers trying to divert us from global apocalypse. Groups of New Agers meditate and ‘tune in’ together at, among other places, Ayer’s Rock in Australia, Maccu Picchu in Peru, the Great Pyramid in Egypt—and Glastonbury Tor. An alternative local-global peace movement to the one of the CND Festival. As the Central Somerset Gazette concluded its preview article: ‘Anyone who can help should contact Andy on the following Glastonbury number … ‘. August 28-31. First Ribblehead Vaiduct Free Festival, near Settle in Cumbria. Acid House declares the Second Summer of Love. British dancefloors get the beat from DJs mixing Chicago house music with Balearic tourist beat, and the club scene trances out on constant bpm and E.
11 June. Wembley Stadium, London. Inspired by Live Aid, Jerry Dammers organises a superstar benefit concert for imprisoned South African activist Nelson Mandela’s 70th birthday party. Whitney Houston, veteran civil rights activist and calypso singer Harry Belafonte, Dire Straits, Eric Clapton, Stevie Wonder, Hugh Masekela and Miriam Makeba. Screened a few hours later in the USA, as ‘A Concert for the Freedom of the World’ rather than for Nelson Mandela, many of the political comments from the stage and references to the anti-apartheid movement are edited out. June. Stonehenge. Riot before midsummer dawn. Fighting between an estimated 3,500-4,500 hippies and 1,000 police near the stones. Hippies beaten back before they reach the stones, apart from a small group who manage to climb the Heel Stone. No one seems to have told the hippies (above) or the heavy metal fans (below) that it’s the Second Summer of Love, though. September. Reading Festival. Iggy Pop, the Ramones, Uriah Heep, Squeeze. Numerous bands blown off stage by crowd trouble-Bonnie Tyler, Deacon Blue, even Meatloaf. September. Athens, Greece. ‘Greek Free Festival’ deteriorates with serious crowd trouble, damages of over £1.5 million, and busy hospital wards. Rioting seems to have flared up when Public Image Limited postpone their set for security reasons-what chance such a reaction if they’d actually played? The only free festival that lasts less time than it is supposed to (one out of three days). June 16-18. Glastonbury Festival, again in spite of planning wrangles with the council. Glorious sunshine all weekend. Sponsored by New Musical Express. Suzanne Vega plays despite a death threat, Van Morrison, Elvis Costello, Black Uhuru, Youssou N’Dour, Fela Kuti. Rave is introduced to Glastonbury by Sugar Lump sound system, who play nonstop 24-hour dance music behind the market stalls. The police are brought into the organisaton and planning of the festival for the first time, around 300 arrests, mainly for minor drugs offences (though local police say the event is ‘a great success considering the numbers involved’). 60-65,000 attend (elsewhere, 100,000 is the number given). £100,000 raised for CND. Tickets £28, programme £2. June 16-18. Morecambe, Lancashire. WOMAD comes to an old-fashioned seaside resort. July 27-August 2. Liskeard, Cornwall. Treworgey Tree Fayre. A commercial event, though heavily alternative music: Hawkwind, Here and Now, Ozric Tentacles, Misty in Roots. August. Free festival scene begins to pick up again, with events like Cantlin Stone, Ridgeway, Cissbury Ring, Rough Tor, Ribblehead through the summer. Free festival-goers get their summer hit of landscape and liberation. Tribal Gathering begins round here, a commercial festival-style event to cater for the rave generation.